Come June what can beat strawberry shortcake made with berries you picked right here in the Finger Lakes? Not much is my answer. So get out there and enjoy! 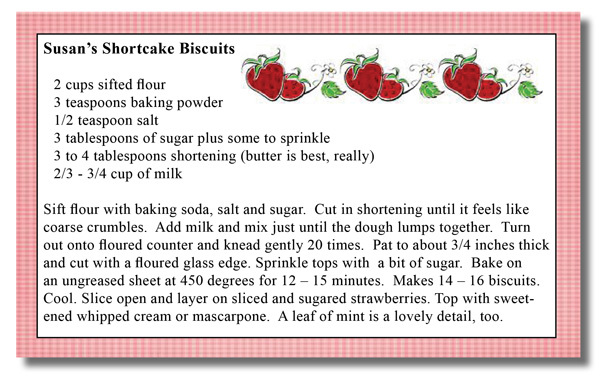 Make a scrumptious Strawberry Shortcake for dessert tonight! I will share my shortcake recipe with you. My family likes old-fashioned baking powder biscuits, but with some sugar added. I served it last week to a bunch of gals who were over for lunch and it was a hit. The berries were from some other place and OK, but not quite like locally picked. With this recipe, you can leave out the sugar and it is a great sandwich roll. Linda Eldred, owner of Strawberry Fields Hydroponic Farm, Rte. 20W, started her unique farm stand about 5 years ago. She visited a hydroponic farm and was fascinated by the concept. When the opportunity to buy one came along, she jumped at the chance and moved it to the current site. Her husband is a big help at the stand, but he also manages over 1,400 acres of field crops. What makes this farm so distinctive is that there is no stooping to pick the strawberries. They are planted in vertical rows in a natural medium – not in soil - and are “fed” 3 times a day with a nutrient rich water solution. Folks who use walkers and wheelchairs can easily maneuver into the rows and spend an afternoon picking sweet strawberries. 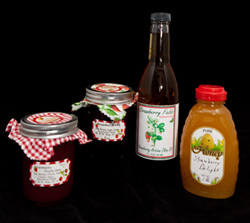 Opening Day will be May 25 from 9 am – 6 pm with free samples of jams & jellies, cheeses, fudge and a new flavor of Strawberry Cheese Cake; balsamic vinegars, olive oils and plants. Buy a hanging basket and get a 4”x6” American flag to wave at the Memorial Day parade. Linda also offers the great option of “Take-Home-Desserts”. Don’t want to bake? Pick up a package of shortcakes, a few quarts of berries and some whipped cream – and you can create your own dessert in minutes. Giancarelli Farm, Winery and Greenhouse, Shortcut Road, Weedsport. 626-2830. Take Thruway to Exit 40, left on Route 34, north toward Cato three miles, take a right on Shortcut Road and go three-quarters of a mile. Open 8 a.m. to 8 p.m. Wednesday and Thursday; 8 a.m. to 5 p.m. Monday, Tuesday, Friday and Saturday; 10 a.m. to 5 p.m. Sunday. Supervised children OK. Baked goods, wine and more! Bibbens Farm, 3282 E. Brutus St., Weedsport. 834-6500. Open 8 a.m. to 7 p.m. Monday through Friday, 8 a.m. to 5 p.m. Saturday and Sunday. Supervised children OK.
Grisamore Farms, Goose Street, Locke 497-1347. Route 90 between Locke and Genoa. Open 8 a.m. to 7 p.m. Monday through Friday, 8 a.m. to 5 p.m. Saturday and 10 a.m. to 5 p.m. Sunday. Supervised children OK.
Peaches, cherries, apples, pumpkins and other luscious fruits will be in season soon too. Check out the Sweet Treat Trail for other great spots to visit. Make sure that you call ahead to any of the Cayuga County farms to make sure that the picking will be good.